Having seen the giants of the ocean from shore during the last few weeks I was longing for a boat trip to have an even closer view at these fascinating mammals. On Sunday we boarded the catamaran of Imagine cruises in Nelson Bay for a 3h whale watching trip. The weather was shoking, rain was pouring heavily on the canvas and the grey of the water was not much different from the colour of the sky. A brisk wind made sure that everyone was putting on all the layers of clothes they had brought along. We left the heads and cruised towards the open ocean. The sea was fortunately not too heavy despite of the wind. Then the skipper announced the sighting of four whales. And suddenly everything else was forgotten. Four whales, just in front of us. We followed the group of whales, and they surfaced in regular intervals of 3 to 4 minutes. One of them was showing off heavily. I had never seen a breaching whale before, not from the shore and not on the whale watching trip I joined in Sydney last year. The moment had come to change this. 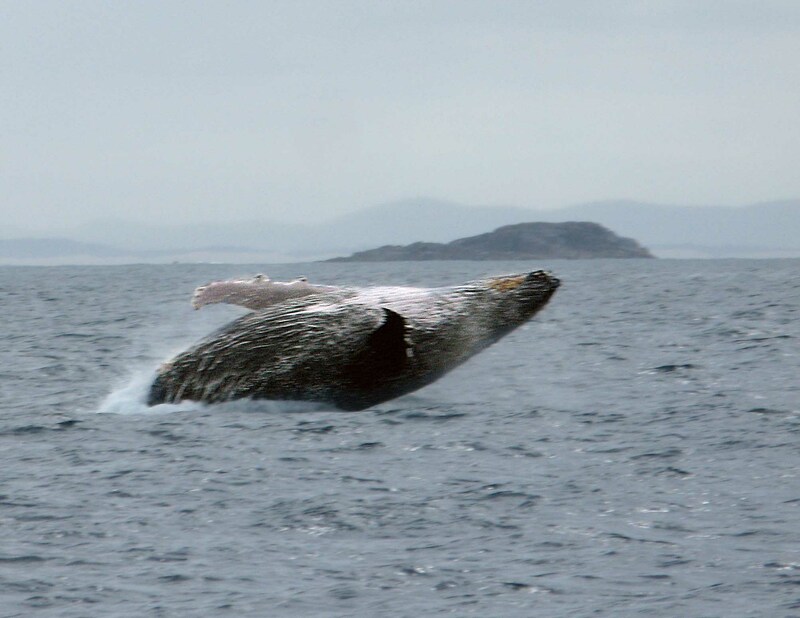 This whale jumped out of the water not only once, but at least four times. Very very impressive. The size of these mammals is impressive as such, the ability to catapult the full body weight out of the ocean even more. The focal point will be selected almost correct as the boats are allowed to get as close as 100m to the whales, therefore not much time is lost focussing, and with the release pressed down all the shots will be taken with the focus settings of the first shot with shutter speeds as fast as possible to get satisfying exposure. My main problem in terms of pictures was that the subjects were out of focus. This entry was posted on July 15, 2008 at 10:55 pm and is filed under Canon G9, Nature, Photography. You can follow any responses to this entry through the RSS 2.0 feed. You can leave a response, or trackback from your own site.